Brain Stimulation: Why Now, But Not Then? Yesterday I was in the campus coffee shop and saw a notice posted for volunteers for a direct brain stimulation study. The mother of what I assumed to be a new first year student or visiting college senior said “Oh look, they’re doing research on brain stimulation. Why don’t you volunteer.” Chuckles ensued. A few decades ago, direct brain stimulation would have been treated with fear, not humor. In the 1970s, for instance, the enthusiastic researcher of brain stimulation, Jose Delgado, was practically driven out of the field for his controversial research. Jose M.R. Delgado was a professor of physiology at Yale University from 1950 to 1974. 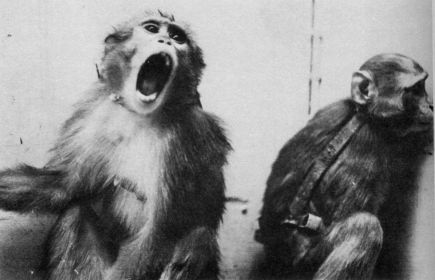 Concerned about the invasiveness and artificiality of some procedures then in use to study the brain, he developed a technique to study brains in monkeys, cats, and later, humans using electrical stimulation. At the time, researchers wishing to understand how the brain worked could either rely on behavioral methods, which involved observing subjects in particular environments or conditions, or technologies such as electroencephalograms (first used on humans in 1924). But both of these techniques limited the kinds of claims a researcher could make: behavioral methods could not tell researchers much about the specific regions of the brain responsible for certain behaviors, while the EEG required subjects to be relatively immobile (and hence not engaged in daily activities). Both techniques prevented researchers from making concrete claims about the brain in use in realistic settings. Delagdo’s technique solved this rhetorical problem: he used radio waves to stimulate brain regions in animals (and later humans) who had been implanted with the stimoceiver. (Delgado insisted that this was a “noninvasive” method, since subjects could move around and keep the stimoceiver for long periods of time—even indefinitely). Because he could observe individuals in “naturalistic” settings, Delgado was able to make broader claims about the implications of his research—which he did in his book, Physical Control of the Mind: Toward a Psychocivilized Society. While he did not go as far as to suggest that humans should regularly be implanted with stimoceivers—a favored dystopic fantasy in science fiction novels—Delgado did suggest that the findings from this type of research could lead to research-based approaches to better educate and train humans. From the 1950s to the 1970s, Delgado undertook a prodigious series of brain stimulation experiments on cats, monkeys, and humans. The range of experimental foci is rather astonishing. Delgado measured how cats could be encouraged to overeat if their brains were stimulated, exposed monkeys to “noxious stimulation” meant to evoke aggression and anxiety, and induced hallucinations in a woman who had experienced epilepsy. For instance, Delgado successfully invoked aggression in a pair of cats whose relationship had previously been “excellent and peaceful”: “as soon as the smaller animal was stimulated it attacked the large one, and a real battle ensued, with snarling, swiping, and biting” and could be repeated as often as the experimenter stimulated the smaller cat. As a result, “a state of mistrust was created” between the two cats (“Noxious Stimulation” 266). 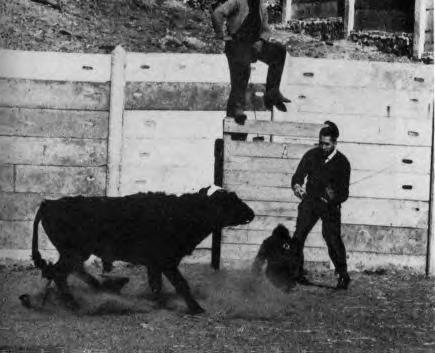 In a study (or stunt) that became front page news in the New York Times, Delgado implanted a stimoceiver in a bull and used it to control the animal as he charged Delgado—a scientific matador. The New York Times called this the “the most spectacular demonstration ever performed of the deliberate modification of animal behaviour through external control of the brain” (1965). Yet, Delgado’s mistake was in taking his claims too far. In Physical Control of the Mind (full text here), Delgado asserted that the late 1960s marked a “critical turning point” that could lead either toward a “psychocivilized society” or its opposite (23). Not only could brain stimulation lead toward medical treatments for individuals with “cerebral illnesses,” such as epilepsy and anorexia (200); it could also alleviate “anxiety, fear, compulsive obsessions, and aggressive behavior” (199), and potentially assist individuals with sensory problems (blindness, for example) (201). Yet, Delgado went beyond that to suggest that all brains should be open to neuropolitical action. What he means by the psychocivilized society is rather vague, and seems to have more to do with good childrearing, moral education, and the like. The point, Delgado suggests, is not whether or not human behavior is controlled, but to discuss “what kinds of controls are ethical” (249), “How should the human mind be structured? Which mental qualities and behavioral responses should be favored or inhibited” (252). While Delgado ultimately positioned the neurological majority as only metaphorically parallel to his monkeys, his attempts at disambiguation here were largely unsuccessful. Brain stimulation was fine for those who are positioned, rhetorically, as obviously in need of remediation, such as the mentally ill person or criminal. But the suggestion that the rest of the population is somehow, also, subject to neurological manipulation seemed too much to take. Shortly after he published Physical Control of the Mind, controversy emerged over the ethical implications of brain implantation research. Delgado was at the center of this controversy. Psychiatrist Peter Breggin submitted testiomony to the Congressional Record in 1972, in which he questioned this research direction, accusing Delgado’s approach as “technological totalitarianism.” In 1973, Eliot Valenstein published Brain Control, a book highly critical of brain-implant research, alleging that. Also in 1973, Maya Pines published The Brain Changers: Scientists and the New Mind Control. These events (along with some conspiracy theorists who claimed Delgado had implanted them with brain chips as part of a government plot) led public opinion away from brain stimulation. Delgado moved to Spain in 1974. He continued his research, but faded from recognition in the United States. Today, Delgado is most often mentioned not by those seeking to use neuroscience to support such policies as teaching handwriting in schools, but on websites devoted to conspiracy theories about brainwashing and mind control. So why is brain stimulation enjoying a renaissance today? Is it simply that fears of brain stimulation and government control have faded? Has government surveillance become so quotidian that it is no longer alarming? Is the dominant metaphor of the brain as a computer led us to think of it less like a fleshy object and more like an electronic one, so that brain stimulation becomes not so different from tinkering with a computer? Or have scientists successfully positioned brain stimulation solely in the realm of remediation for individuals with brain impairments? In my book project, I explore how and why brain stimulation has become naturalized and acceptable in the 2000s and 2010s using disability theory which, I think, provides part of the answer. What’s the Deal with Mindreading? Mixed Metaphors: Is Consciousness a Lightswitch, a Gate, or a Conductor?